As the 2011-2012 school year draws to a close, I want to thank each and every one of the PICAns for the energy and enthusiasm they gave to the PICA Program this year. The seeds that were planted last September have germinated, grown, and produced fruit. It has been an exciting year of activity and accomplishments. Just look at the Foundational Roots Garden, and you will see what I mean. It is full of diversity, energy, hard work, and good things to harvest and eat. Think back on all the delicious community meals that you have consumed. You have set the bar for what it means to eat local, eat healthy, and build community. Saturday workdays have become a tradition, as you not only brought the PICA community together in the garden, but also opened it up to involvement from students from across campus. You have shown what it means to engage sustainability at every step of the food system, from the seed and soil to the table (and thanks to composting – back again!). Thanks are also in order for the excellent guidance, support, and mentoring from our special staff of Bee, Bethany, and Mira, as well as our CUIP intern Andrew. What an amazing team! For those of you who are graduating and moving on to the next phase of your lives, I know that you will be carrying with you the agroecological thinking about food and the food system. I also know that you will be at the center of community building wherever you go next. For those of you who will still be near campus, but not living in The Village, I know that you will carry with you the traditions and commitment to living sustainably that you absorbed when you were here. You are still PICAns, so stop by as often as you can. And for those of you who will be returning to PICA next year, or those who will be new PICAns, I look forward to sharing more agroecology and community with you. Have a great summer, and may your harvests be plentiful. It was only by chance that I ever happened to be in PICA, but it has been one of the most rewarding experiences of my young life so far. I have only recently gotten into the subjects of Agroecology and Permaculture, so gardening was not quite at the top of my list of requirements for housing. Luckily, my mom had other ideas about that and gently kept prodding me in its direction, until, all of a sudden, I was signed up for PICA and was coming down to live here. When I first got here, I was the second one to move into my building, and my one housemate was out and about at the time. Iroamed down the hall reading off all of the name tags as I went: Tyler, Sam, Emily, Andrew, Sara, Leah, Hannah, Jordan, each one had their own little drawing next to them. I wondered about how we would all interact and the adventures we would have in the coming year, and most importantly, would we all be able to get along and mesh together? I met Andrew when he came home, and Tyler soon after he got there later that night. We had a long and rambling discussion about something that I can’t remember, but during that time, I knew that I would have a really good time here regardless of however the rest of my housemates were. The whole next week, I met more and more people, until I had eventually met everyone in the quad. To date, that has probably been the longest and most fun week that I can remember. I had nave never wanted to prolong summer so badly in my life. Starting school that Monday was a bit of a downer, thinking about all that fun we had, and that now, with school, we would have to tone it down a bit. That thought ended about noon when I came home to find Gracie and Simone from the next building over painting a huge mural on some large pieces of cardboard. For the first time since third or fourth grade, I was asked if I wanted to paint. At that exact point was when I first started viewing PICA as my home. We have had a long and adventurous time so far this year. Through our downs and mostly ups, we have bonded over many an experience that has left us better off. We have lost a few PICAns to graduation, hardship, and other instances, but they are always remembered and greeted with great joy when they return. And in that void that they left, other new members have been welcomed joyfully into our community of gardening, playing, and working together. PICA is about agroecology and gardening, but I believe that the most important aspect of PICA is the diverse community of people that live here. 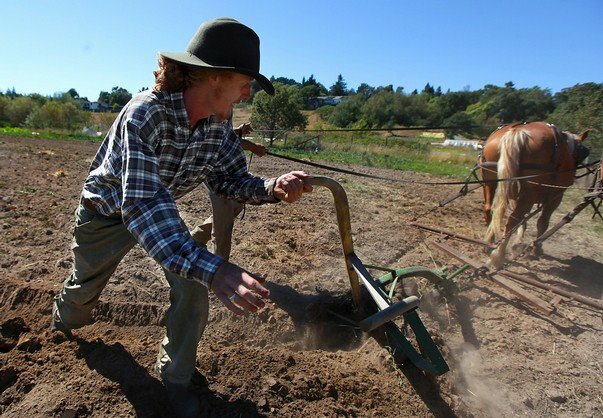 So much of the sustainability movement from where I was living in Sonora, CA was about the doom and gloom of unsustainable farming practices that occur in the U.S. and the world as a whole. 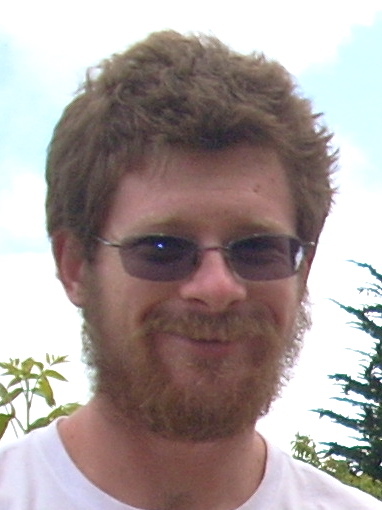 It was also about working hard to grow organic foods and to teach others how to do the same. These are all very good things to have done and learned about, but I feel PICA has given me so much more. In PICA, I have met people from all aspects of life, each person having different ideas on where they would like to go in their studies, from linguistics to plant sciences to psychology to physics. Different ideas are flowing all the time at PICA and it has led to a community in which life is not about the garden we have, but the community we have made around it. 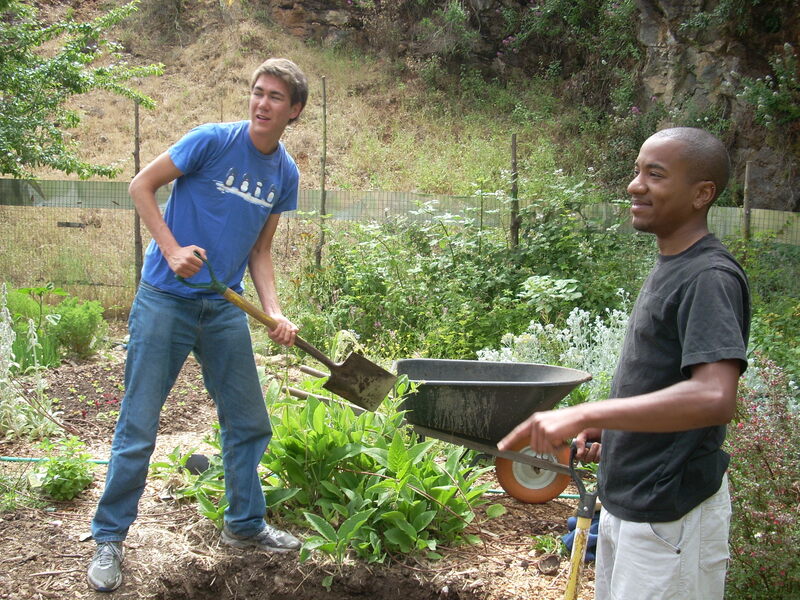 Here, at PICA, gardening is not something that needs to be done, gardening is just a part of who we are. 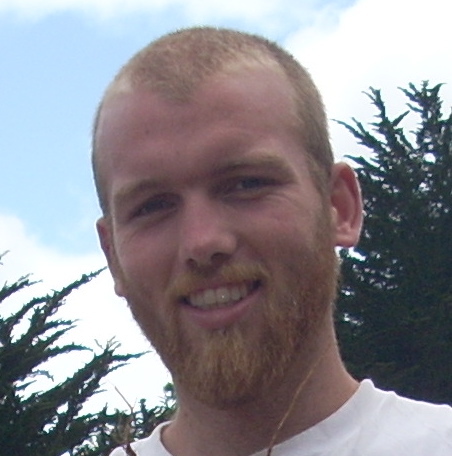 Forrest Verde-Green is PICA’s Community Meals Coordinator and a member of the Leadership Team. He plans to continue living sustainably off campus in a communal house with other PICA students. Last quarter, I became a PICA intern under Bee’s supervision. 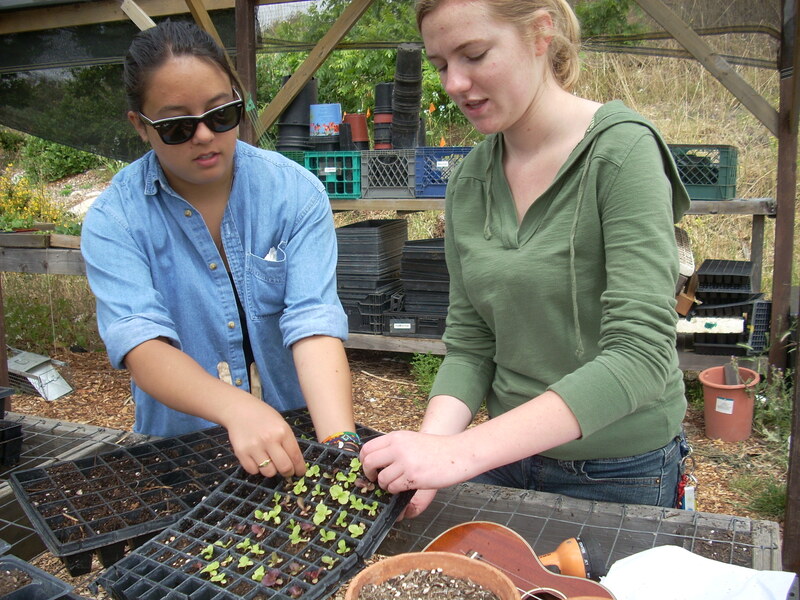 The initial goal of my internship was to facilitate the planning and logistics of hosting a field trip for K-12 students from Pajaro Valley Unified School District at the Sustainable Living Center. Our field trip would be a chance for Environmental Studies students with an interest in environmental education to develop their pedagogies. Bee had bigger plans for us. Justine, a converted math major with brilliant ideas; Jen, the pragmatic expert on education; Me, the lead intern; Bethany, the kinesthetic learner with a knack for artwork; Jenny, the much needed comedic relief with a strong work ethic. With Bee’s innate ability to challenge us and hold us accountable, our one goal became many goals: raising funds to sponsor the entire field trip, creating a salsa-themed preliminary lesson to introduce our guests to food system and sustainability science, learning methods for teaching to English Language Learners, and implementing experiential learning techniques. Luckily, I was a part of a team of incredible interns who were up to the challenge. Whenever Bee gave us a direction or idea, we followed through. Our group became a support system for all of us to rely on, and we were able to take our goals further than we’d ever imagined. 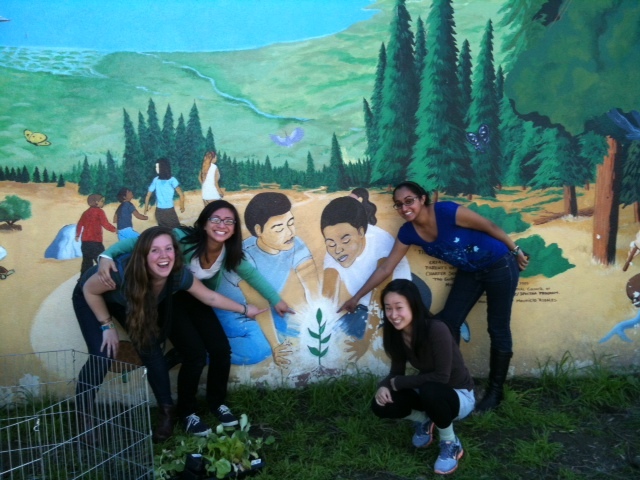 The interns strike a pose at Watsonville Charter School of Arts after implementing their Pre-Lesson: “From Soil to Salsa”. May 17th was the day of our first field trip. 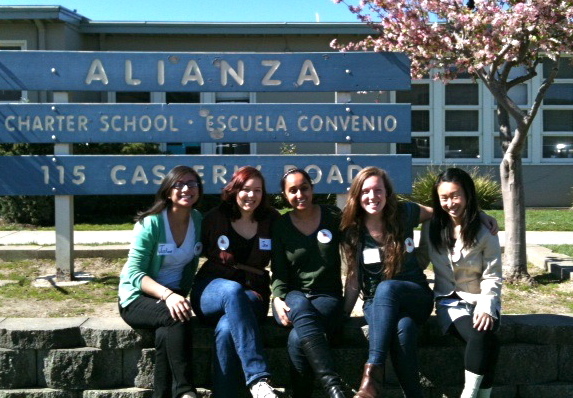 Shannon Hammond arrived with her class of 6th graders from Watsonville Charter School of the Arts. 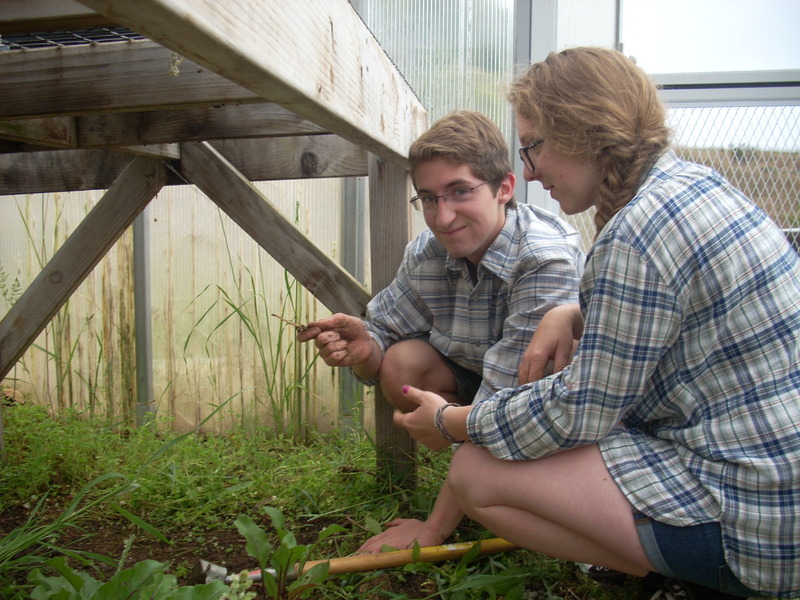 The kids were guided through the Sustainable Living Center one-on-one with college students, exploring the flora and fauna using a “Field Guide to the SLC”. We divided into small groups and travelled through the Compost Piles to the Propagation Center to learn the ingredients and work that go into gardening. At the Foundational Roots Garden, students learned that pollinators also work very hard to help plants grow, and went on a flower adaptation scavenger hunt. The day’s work culminated for the students at the herb spiral, where they made a snack of salsa using fresh herbs, and discussed the take home messages of sustainability. Next week we look forward to another field trip, this time with a group of bilingual 5th graders from Alianza Charter School. 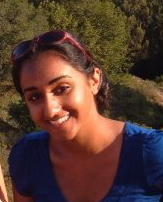 Jasleen will be graduating from the Environmental Studies Department this Spring alongside many of her Environmental Education Senior Seminar cohorts. PICA has been the most life-changing experience I have ever encountered. I became interested in PICA after doing research about university housing. Being a plant sciences major with an interest in agriculture, PICA was the perfect opportunity to learn and I jumped right in. I did not really know what to expect upon arriving, but any expectations I had were met and exceeded. I figured that I would be learning only about agriculture. The word that I had underestimated in PICA was “community”. My housemates quickly became my family. Soon, we never left home, I did not see the need to leave when all the friends I have were right in my very home, PICA. In my perspective, the reason our family grew and flourished revolves around one simple thing: food. Food grown in the garden, food on our plates for community meals, and the topics presented on the politics of food. Garden workdays are very calming and enlightening before a day of study. I wake in the morning to double dig, sow seeds, smell compost, and meet friendly people eager to learn more about gardening. Teaching people about gardening is amazing as well. Seeing the inspiration and desire to learn on people’s faces equally inspires my desire to learn and explore. The conversations that I find myself in always bring something new to the table. Amongst our houses, we cook community meals every day. We have gotten into the habit of sharing and making meals for everybody instead of the typical single serving college student meal. A great question was posed to me the other day by Sheila. She asked me if I would ever have thought to cook communally without PICA. In retrospect, I do not think I would have. I do not really see any other way of eating anymore, if my friends are hungry, we will cook. 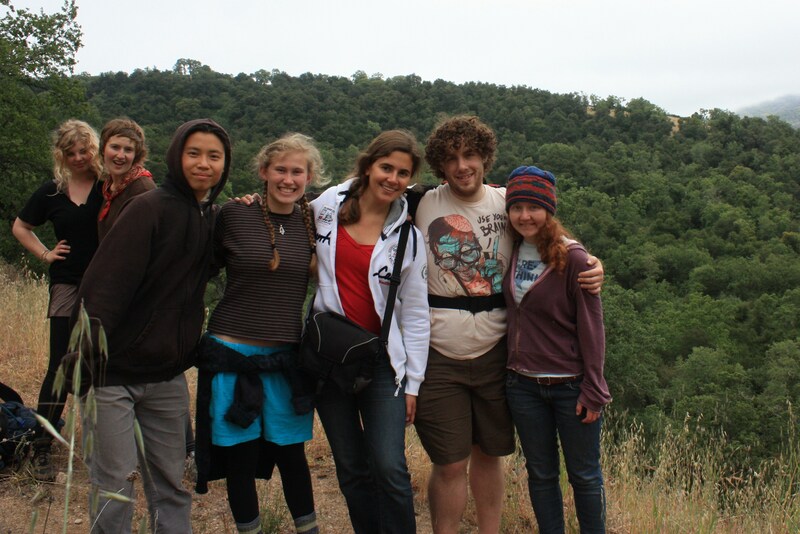 Some of the current PICAns, fellow workday regulars, and myself are starting a community off-campus together next year. We plan to create an environment like the one that PICA has nurtured. We will continue gardening and eating meals together, as well as sharing our knowledge and “fruits” or our labor with the greater Santa Cruz community. The only reason this plan was at all possible is because of PICA. It creates a platform where people can learn about community living at their own pace. It has no set requirements, accepts all, and everybody benefits. I can honestly say that PICA has forever changed my life. Life is looking out for us. Small, seemingly unrelated events lead us to exactly where we need to be, if we are open to their guidance. 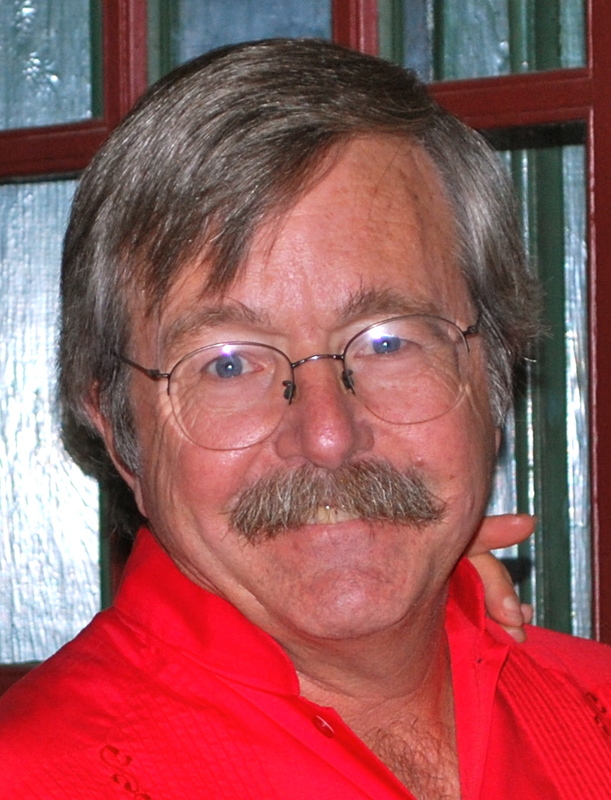 The path I am on now began for me with a suggestion from Professor Don Rothman to move into the Village and join PICA. Once there, I was exposed to other student organizations on campus such as the Student Environmental Center. While I worked with those enthusiastic activists, staying at PICA helped me realize that how we choose to live our lives is activism. In a country where less than 1% (and the majority of that 1% is over 60 years old) of the population is in agriculture, farming is activism. 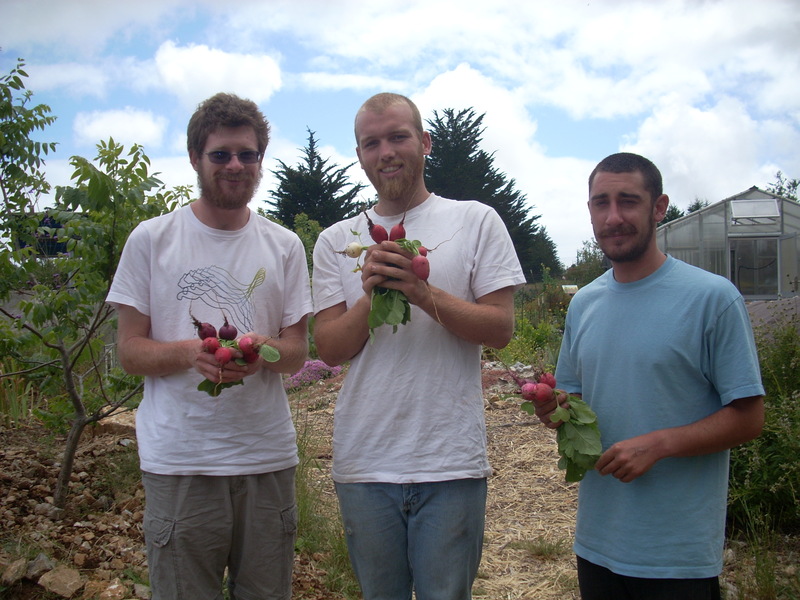 I run New Family Farm in Sebastopol, CA with two other PICA alums, Felicja Channing and Adam Davidoff. The values we learned in PICA inspired the structure of our farm (perhaps I should call it an agroecosystem). 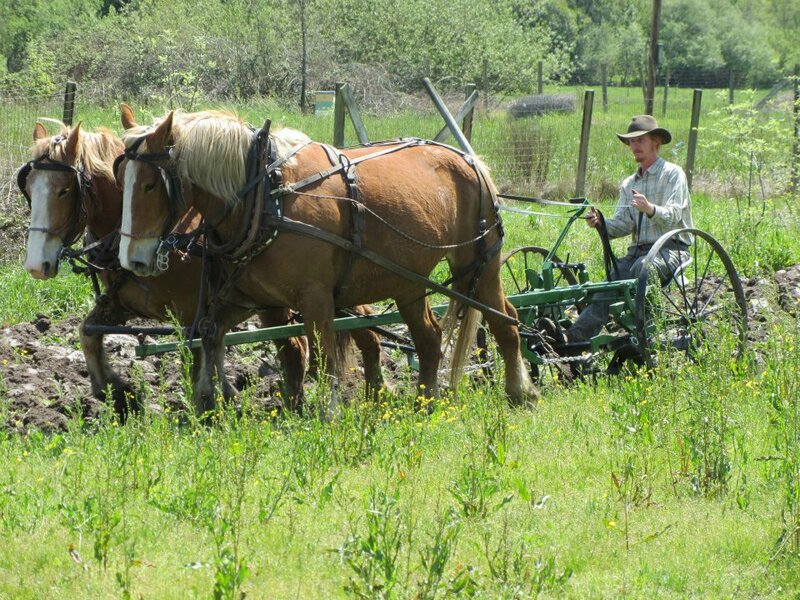 We manage about 18 acres in the coastal hills and valleys west of Sebastopol. Our valley is a seasonal wetland, full of life and dense grass come Spring. 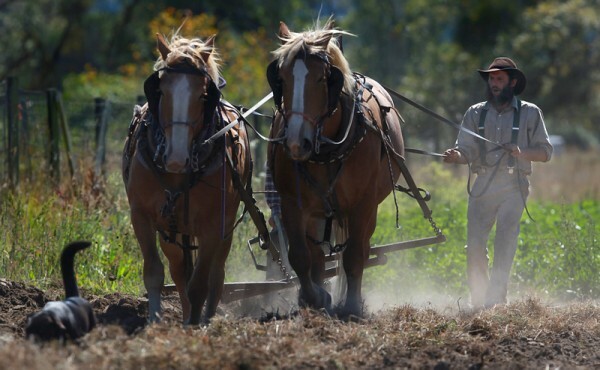 We work with three draft horses – Misty, Quinna (both Belgian mares), and Sparky (a percheron gelding) to do all the fieldwork from plowing to weeding to harvest. Working with horses has fundamentally changed my relationship with the living world. We grow vegetables on 6 acres (we will be up to 8-10 by next season). We also breed, raise, and milk Alpine/Nubian dairy goats. Additionally, we breed and rotationally graze a heritage breed of pigs called Tamworth. All of our animals are linked in some way with the crops, either through rotating them through the fields or harvesting their manure for compost. In this way, our whole farm is a self-renewing family of plants and animals. Speaking of family, Felicja and I also raise our daughter, Aniela, who is two and a half years. She is the impetus for the name “New Family Farm.” She brings me so much joy. I feel privileged and honored to be a steward of this land. I have so much gratitude for the opportunity to live the way I do. I have a lot of responsibility now, and a lot of duties. But this does not daunt me. I have found that when you are exactly where you want to be, duty is the blessing that will keep you there. Looking back, and I write this without any exaggeration, I see PICA as the first step of this journey that I will be on in one form or another for the rest of my life. 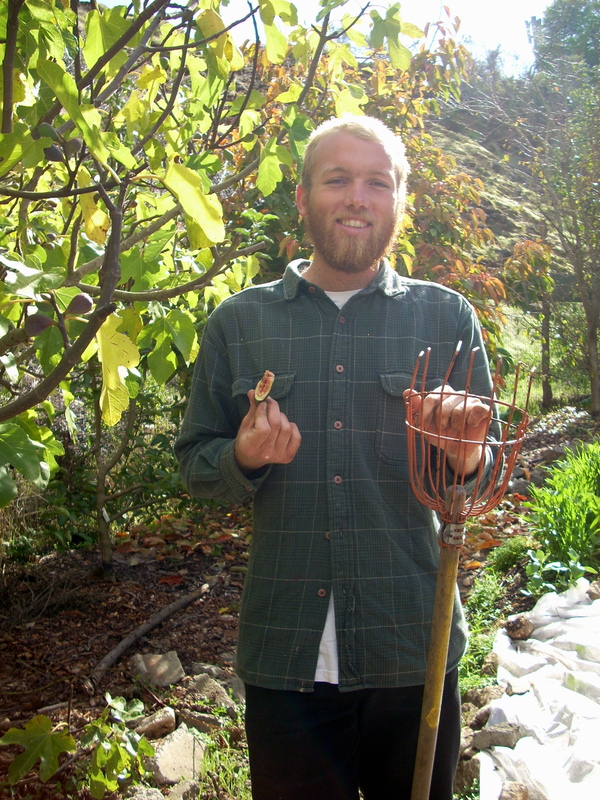 Ryan Powers is a former PICA student who, along with two other former PICAns, runs New Family Farm in Sebastapol, CA.